And, he wears a diaper. Love the pictures, especially the last one. One tired little dino. In my house we have a diaper-wearing pirate, who shouts, “ahoy, ahoy my parties”. A very VERY cute dinosaur though 🙂 Not the scary type but the cuddly type. May I cuddle that dino? Cool! That’s quite an expression. 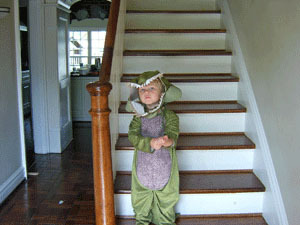 And at least there’s a child within that dinosaur suit ( a warm blooded creature. My friend has just rescued a neglected dragon (seems to me they must be the same family as the dinorsaur, or descended from them, don’t ya think?) I forget which species, but she’s got that 4 foot long dragon staying in her living room along with an assortment of rescued (bald too) birds.